The IsoArcH database is divided into four main categories according to the nature of the bioarchaeological sample used for isotopic analysis: human, animal, plant and organic residue. Each category consists of multiple subsections that are devoted to specific information related to the context of the sample. These subsections are often presented in the form of a drop-down menu. Otherwise, data are fill in text (e.g. Material culture; cf. table 1). Firstly, for the category of human, classification details start with the individual identification number which is mentioned with respect to its label in the original publication. In the absence of the individual identification number in its reference, a number by default from 1 to n is attributed. This is followed then by the datasets of the archaeological site from which samples originate (Table 1). Table 1. Data related to the archaeological site from which bioarchaeological sample originate. If the sample originates from a known funerary context, a wealth of anthropological information flows. Therefore, two subsections are coded; the funerary structure (Table 2) and the biological identification (Table 3). Table 2. Data related to the funerary structure in which sampled human bones were deposited. Table 3. Data related to the biological identification of the individual from which sample was conducted. To ensure the standardization of data and comprehension of the context of samples from human individuals, definitions of the vocabulary used in “Funerary structure” (cf. table 2) and “Biological identification” (cf. table 3) are given on the IsoArcH website. Later, the chronology of the sample is detailed (Table 4). Table 4. Data related to the chronology of the bioarchaeological sample. When it comes to the isotopic data on the human samples, which can include a fragment of bone, tooth, hair, beard, nail, muscle, skin or gut, complementary data exist. The anatomical part is defined (cranium, ulna, talus, etc.) if the sample is a bone while the fraction of the skeletal part can be defined as mineral or organic, but only for bone and tooth samples. The other types of human samples (beard, nail, muscle, skin or gut) are designated organic. Additional data is needed if the sample is a tooth (Table 5). Table 5. Isotopic data on human samples for the type of a tooth. Furthermore, regardless the type of the human sample, information about fraction are filled in (Figure 1). One will find in the last section the references to all publications used to feed the IsoArcH database. Secondly, in the category of animal samples, classification details also start with the individual identification number respecting the same system of numbering, followed by the datasets of the archaeological site (Table 1). Archeozoological data about the origin of these samples contain the designation in the publication and then the biological classification (i.e. class, order, family, subfamily, genus and species). Later, as for the human samples, the chronology of the animal samples are detailed (Table 4), followed by defining the skeletal part (bone or tooth). The isotopic data is presented in the same way of the human samples (figure 1). Finally, the references to the cited publications are included. Thirdly, the same logic used for human and animal samples operates for the category of plant, concerning the individual identification number and the site (Table 1). Botanical data contain the designation of the plant sample in the original publication then the biological classification (i.e. family, genus, species and metabolism type). In addition, the chronology of the sample is noted as for the two previous categories (Table 4) followed by the analyzed anatomical part of the sample. Concerning the isotopic data on these samples, it starts by defining whether or not the sample is charred then if it is pre-treated or not. 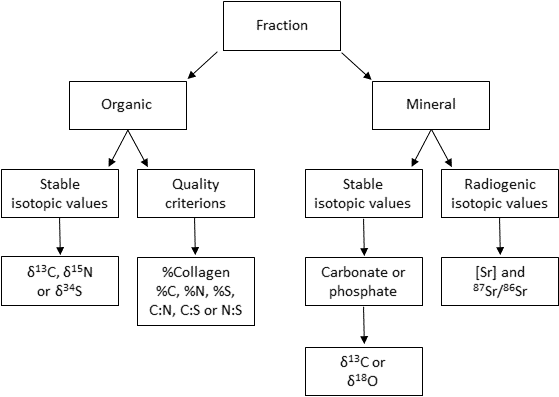 The isotopic data is presented in the same manner as the organic human and animal samples. At the end, the references to the cited publications are included. When it comes to the last category, the organic residue, one can find some aspects of human, animal and plant datasets. Thus, individual identification number, site from which the sample originates (Table 1) and chronology of the sample (Table 4) are present. Furthermore, the isotopic data is presented in the same way of the organic samples. The references to the used publications are included. So far, IsoArcH compiles data from dozens of scientific publications for 4,000+ humans, 2,000+ animals, 100+ plants, and 10+ organic residues coming from nearly 300 archaeological sites. The initial data harvesting consists in a list of data in a simple spreadsheet. Henceforth, to respond to the visions of IsoArcH, we have emerged it in a relational database which enable users to processing data efficiently. This relational database allows storing a piece of data only once, and giving it a unique identifier (id). Data are stored in double entry tables, the number of columns defining the number of details (attributes) that can be stored for each occurrence which is stocked in a line in the table. An occurrence can be linked to another one by storing its id. This is called a relation. In this context, the attribute that stores the id of the site is called a foreign key. Thereby, in the case of several individuals coming from the same site, data will not be copied for each individual occurrence. For IsoArcH, the phase of emerging the database consists of splitting lines into pieces of data, group them into tables, and design the relations among the different tables. In a nutshell, 50 tables, 182 attributes and more than 80 relations have been created in order to be able to include the large variety of data presented in the previous sections. 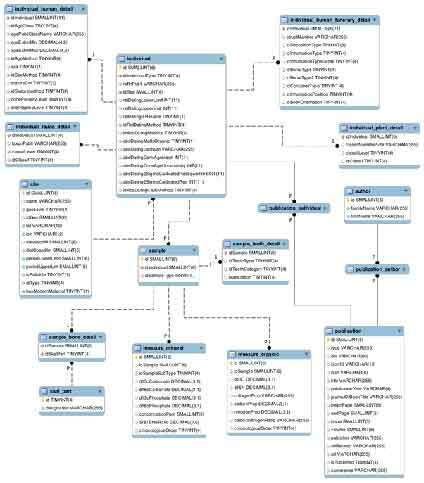 Figure 2 provides a visual overview of the database modelization. Rectangle figures depict tables with their list of attributes. Lines depict relations between tables they link. The type of relations, one-to-many (symbol P) or one-to-one (symbol 1) is noted on lines. Solid lines highlight relations of type plural-plural. In this case, a table is created to store pairs of foreign key. The attributes preceded by a red diamond are foreign keys. While, empty diamonds indicate the possible inexistence of the relation for certain occurrence (e.g. a plant individual will never be related to funerary details). IsoArcH is a collaborative database which intends to give users three possibilities to deal with its digitalized content according to their scientific needs. Firstly, visitors can simply explore available data online. The database can be queried through HTML forms styling with CSS. Users can target the searched data, and sort selected groups of samples with the help of a set of criteria proposed in the drop-down lists (e.g. site, country, chronology or isotopic proxy). The advantages here are the presence of data filters that can be selected and the possibility to query most of the fields of the database. Secondly, it is also possible to export data from IsoArcH to be used for individual scientific productions (i.e. papers, talks or posters). For this, the results of the queries are accordingly translated into SQL language to extract the data from the MySQL database. Later, the results are formatted into CSV format to be easily downloaded and opened by a spreadsheet application or even processed in programs as statistical and chart softwares. Finally, users can upload their isotopic data, with or without their metatdata, which can be published in IsoArcH. For this, HTML form styling with CSS are used. Drop-down lists with the predefined and proposed items can be used to submit data. If not, manual entries are also possible. In all cases, submitted data must be validated before being published. Therefore, administrators of IsoArcH double check the submission to ensure both the maintenance of data consistency and its standardizing. Once the new data is approved, it is then integrated into the database and made available online. The produced ancient world maps cover the time periods on which IsoArcH focuses. As for now, maps for Persian, Alexander’s, Roman and Byzantine empires, as well as many other chrono-cultural entities are displayed. These maps serve as backgrounds on which archaeological sites of our database are projected. Each site has been georeferenced by the authors in the WGS84 geographic coordinate system. Records of latitude, longitude, altitude and distance to the coast of sites have been reconstructed as accurately as possible. Latitude and longitude were found mainly through the website LatLong (http://latlong.net), whereas altitude and distance to the coast were estimated thanks to the Google Earth program (http://google.com/earth). In addition, the projected maps are interactive web ones. It is possible, in effect, to use them to explore the database without initial query. They also serve to display selected sites at the end of a specific query. By clicking on each site, users can have a summary of data about the site itself but also about its metadata (e.g. site name, number of referenced individuals, population means for isotopic values and publications). Apart from a simple exportation of the generated maps via the print screen which allow users to paste a copy of these maps in graphic software, IsoArcH does not currently have a specific tool to realize this operation.